JUMO’s forward-looking wireless transmission technology has allowed a vast reduction in installation expenditure in all industrial applications. There are also other perfectly obvious advantages. In hard-wired systems, long connecting cables almost always hinder the user. Wireless-based temperature sensors provide effective and convenient alternatives compared to hard-wired systems, particularly at higher process temperatures. There are no vulnerable, costly, cable connections and the wireless-based temperature and pressure sensor technology also works in a harsh, industrial environment, as well as in potentially explosive atmospheres. The costs for maintenance, repair and re-installation are also reduced, compared to hard-wired measurement data transmission. 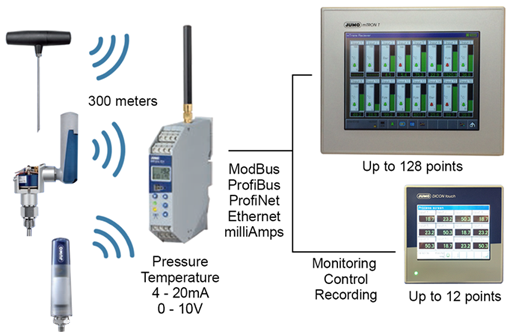 These developments open up totally new areas of application for user-friendly measurement value recording and transmission of temperature data. Further developments have let to the introduction of more versions been added to the JUMO Wtrans temperature measuring system, taking into account diverse customer requests for products covering a wide variety of different areas of application. New to the product line is a transmitter with ATEX approval. Also new to the Wtrans family of products are transmitters containing a highly temperature-resistant electronics module, that can be used up to a temperature of 125°C . For further details on the Wireless range from JUMO please click here. We carry many more instruments for various other applications. Should you not find an instrument that you need please contact us directly and we will gladly be of assistance. Non-contact pyrometers for a range of applications.